Objectives To analyse persistence and adherence in patients with multiple sclerosis receiving first-line treatment with subcutaneous glatiramer acetate 20 mg (GA), subcutaneous interferon β1a (IFNβ1a-sc), intramuscular interferon β1a (IFNβ1a-im) and subcutaneous interferon β1b (IFNβ1b-sc) and to identify associated factors and reasons for discontinuation. Methods An observational retrospective study was performed between January 1999 and November 2014. Persistence was defined as the time from treatment initiation until discontinuation, and adherence as the number of units dispensed since treatment initiation until its interruption divided by the theoretical number of units needed to cover said period as a percentage. A patient was considered adherent if ≥95%. Persistence was measured using the Kaplan–Meier method and univariate Cox regression; adherence was measured using a univariate binary logistical regression model. Results The study included 224 patients. The median persistence was 1349 days (95% CI 1017.4 to 1680.6). 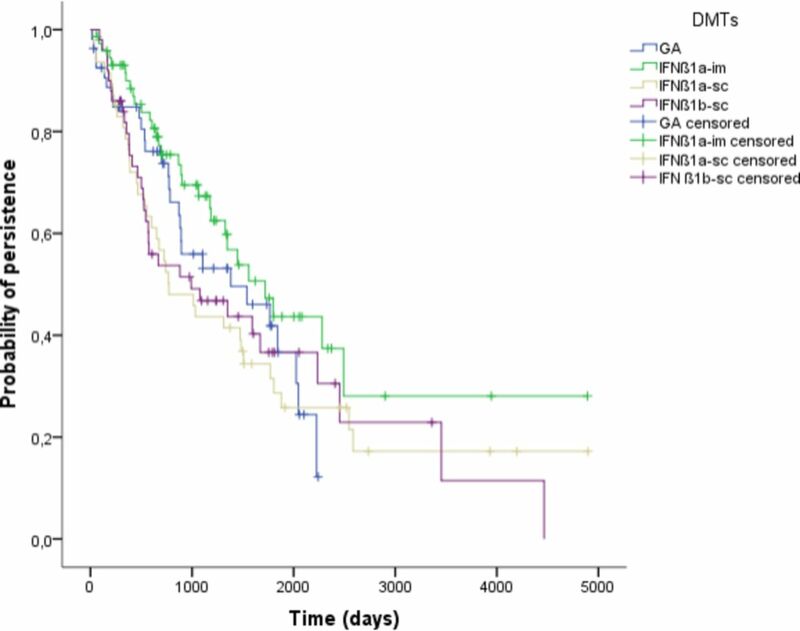 Patients receiving IFNβ1a-im continued treatment for a longer time (1720 days; 95% CI 1196.8 to 2243.2), while patients treated with IFNβ1a-sc had the lowest persistence (771 days; 95% CI 377.4 to 1164.6) (HR=1.7; 95% CI 1.02 to 2.72). Patients with Expanded Disability Status Scale (EDSS) 1.5–6 discontinued treatment earlier than those with EDSS 0–1 (HR 1.5; 95% CI 1.01 to 2.25); 94.4% of patients discontinued treatment due to medical decision, primarily due to lack of efficacy (24.6%) and adverse effects (17.4%), while 80.8% of patients had good adherence. GA had the highest adherence, with no major difference from IFNβ1a-im, while IFNβ1b-sc showed the highest non-adherence (OR 3.5; 95% CI 1.29 to 9.28). Conclusions The persistence levels obtained were lower than in similar studies. EDSS was identified as an independent predictor of treatment interruption. Acceptable adherence was achieved among the population, comparable to other studies and influenced by the drug. Adherence is defined by the International Society for Pharmacoeconomics and Outcomes Research as the extent to which a patient acts in accordance with the prescribed interval and dose and dosing regime.5 Equally, the World Health Organization defines adherence as the extent to which the patient’s history of therapeutic drug-taking coincides with the treatment prescribed by the healthcare professional.6 Persistence is defined as the time during which the patient continues treatment—that is, the time elapsed from initiation until interruption.5 The measurement of persistence is relevant, among other reasons, because a minimum time of treatment duration is required for drugs to be effective. The primary objective of our study is an overall analysis of persistence and adherence among DMTs with parenteral subcutaneous and intramuscular administration (DMTps) as first-line treatment for patients with a diagnosis of MS. Our secondary objective is to identify the associated factors and reasons for discontinuation. An observational retrospective study was performed in naïve patients with a diagnosis of MS who started first-line treatment in a University Hospital between 1 January 1999 and 30 November 2014. The follow-up period was from treatment initiation until discontinuation or the end of the study (May 2015). Patients who started treatment in another centre were excluded. The parenteral DMTs analysed were those marketed at the time of treatment initiation: subcutaneous glatiramer acetate 20 mg (GA), subcutaneous interferon β1a (IFNβ1a-sc), intramuscular interferon β1a (IFNβ 1a-im) and subcutaneous interferon β1b (IFNβ1b-sc). Patients were selected through the Pharmacy application for Outpatients, and clinical data were obtained from the review of electronic clinical records as well as from the forms requesting treatment initiation. The variables collected were: gender, date of birth, form of evolution, EDSS before treatment initiation, first-line drug, dates of treatment initiation and interruption, units dispensed and reasons for interruption. Treatment interruption was classified depending on who took the decision—the neurologist or the patient. Persistence was defined as the time in days from treatment initiation until discontinuation for any cause,7 according to Pharmacy records. For periods between dispensing >1.5 times the time covered by the medication dispensed, persistence was confirmed through the electronic clinical record. Patients do not need to go for refills with a new prescription each time; prescriptions are valid until the next doctor’s appointment in several months' time. The sequencing of the different doses of IFNβ1a-sc was not considered discontinuation. Treatment interruption refers to the percentage of treatment interruption at any time of follow-up. The adherence rate (A) was calculated as the number of units dispensed since treatment initiation and until discontinuation (D) divided by the theoretical number of units needed to cover said period (N) × 100 times (A = (D/N) × 100). A patient was considered adherent if ≥95%.11 For the mean calculation, adherence >100% (data resulting from medication collection in advance) was considered as 100% adherence. A descriptive analysis was conducted, presenting categorical baseline variables as absolute frequencies and percentages and continuous variables as means and SD. Comparison of the baseline demographic characteristics (gender, age, form of evolution and EDSS) between the treatment arms was conducted using the ANOVA test, χ2 test or Fisher exact test. For analysis, patients were classified into two groups according to mean age and EDSS in order to obtain two arms of similar size. Differences in persistence were estimated based on the drug and demographical variables using Kaplan–Meier survival techniques (log-rank test) and univariate Cox regression. The analysis of adherence by parenteral DMTs and the determination of the association between adherence and the different demographical variables was analysed using a univariate binary logistical regression model; the group with the highest adherence was used as a reference for each variable. The statistical program SPSS V.19.0 was used for data analysis. Confidentiality regarding personal details was maintained according to the current national legislation. The study included 244 patients. Their mean (SD) age at treatment initiation was 36.4 (10.2) years and 65.2% were female. The predominant form of MS was RRMS (92%). Regarding treatment, 32.6% of patients received IFNβ1a-im, 24.1% were treated with GA, 22.3% with IFNβ1b-sc and 21% with IFNβ1a-sc. Table 1 shows the demographic and clinical baseline characteristics of the population. The four treatment arms were homogeneous with regard to gender, age and EDSS, but not in terms of form of disease evolution. All patients in the GA arm had RRMS while around 10% of patients in the IFNβ1a-sc and IFNβ1b-sc arms had SPMS. Approximately half of the population with EDSS on record had values between 0 and 1 and none of them had EDSS ≥6.5. By the end of the study, 55.8% of patients had discontinued treatment, 36.6% were still on treatment and 7.6% of patients were lost to follow-up. The median time of overall persistence estimated using the Kaplan–Meier method was 1349 days (95% CI 1017.4 to 1680.6). The probabilities of persistence at 6 months and 1, 3 and 7 years were 91.9%, 83.9%, 54.6% and 23.1%, respectively. There were no statistical differences in time of treatment continuation between drugs (p=0.16). However, it was observed that patients receiving IFNβ1a-im continued treatment for a longer time. Taking IFNβ1a-im as a reference, there was a statistical difference in persistence for IFNβ1a-sc with HR 1.7 (95% CI 1.02 to 2.72) (see table 2 and figure 1). Kaplan–Meier survival curves (persistence) for glatiramer acetate (GA), intramuscular interferon β1a (IFNβ 1a-im), subcutaneous interferon β1a (IFNβ1a-sc) and subcutaneous interferon β1b (IFNβ1b-sc). The reason for discontinuation was a clinical decision in 94.4% of cases, mostly due to lack of efficacy (24.6%) and adverse effects (17.4%) (figure 2). Among those patients who did not continue treatment beyond 6 months, treatment discontinuation was due to toxicity in 82.4% of cases. Regarding the study on adherence, 80.8% of patients had good adherence with a mean rate of 97.2%. Adherence was highest with GA and was not significantly different from IFNβ1a-im, while IFNβ1b-sc had the highest non-adherence rate with a risk 3.5 times higher than that of GA (table 3). In the overall study on persistence and adherence by gender, age, form of evolution and EDSS, we did not find any significant differences except regarding persistence for EDSS. The risk of discontinuation estimated for patients with EDSS 1.5–6 was 1.51 times higher than that for patients with EDSS 0–1 (table 4). Treatment discontinuation occurred in 58% of adherent patients and in 46.5% of non-adherent patients (p=0.17). After analysing adherence data according to the reasons for treatment interruption, 13.1% of patients who discontinued due to lack of efficacy were non-adherent, as well as 13.3% of patients who interrupted treatment due to adverse effects. Seven patients interrupted treatment voluntarily and three of them were non-adherent. The benefits of continuous treatment in the setting of chronic conditions have been well documented; in the case of MS, these translate into a slower progression of the disease. Previous studies have shown that those patients with higher adherence and persistence have a lower risk of relapse and a better quality of life; this is also associated with a lower use of healthcare resources.7 12 13 For these reasons, it is relevant to study treatment persistence and adherence, such as has been analysed in this retrospective study on naïve patients who have started first-line treatment with parenteral DMTs over a 16-year period. The literature on persistence and adherence studies shows a lack of homogeneity in the measurement methods and definitions, as pointed out by other authors.14 Thus, we have observed variability when comparing persistence results with other studies, possibly due to differences in design, sample size and definitions. The retrospective series by Correia et al 10 shows similarities to our study and our discontinuation rate, although the median persistence in our study was lower (1349 days vs 1614 days). Both studies had similar definitions of persistence and both were retrospective single-centre studies. The differences between them may therefore be due to the fact that, in the Portuguese study, the patients presented exclusively with the RRMS and CIS forms of the disease. In addition, the outcomes could have been affected by variability in the clinical management of patients, a reflection of the existing lack of consensus on criteria for progression to treatment, a factor that we have not analysed. Our estimations for persistence at 6 months and 1 year are higher than those obtained in studies conducted with large healthcare system databases such as the cohort studies by Evans et al 15 and Reynolds et al. 16 Sample size is probably a decisive factor for these differences. According to the literature available, we found a higher tendency for interruption of treatment in women and in younger patients.16 We also observed that EDSS had a significant influence on persistence. Patients with more advanced disability will discontinue treatment earlier; the explanation put forward by Correia et al 10 is the need to change lines of treatment in order to prevent future progressions, which is a hypothesis not analysed in our study. It was not possible to assess the association between persistence and the form of disease evolution due to lack of homogeneity between the groups. It is estimated that half of patients with chronic diseases have low treatment adherence,19 which is why we highlight the acceptable adherence rate in our population (80.8%). It is difficult to compare adherence rate results because different studies will use different definitions and different methods of calculation. Following a review of the literature, we consider that our study was reasonably demanding (≥95%). Thus, the Global Adherence Project study in Spain estimated a 75% adherence rate in patients with RRMS, using a very strict definition of adherence (100%).13 However, the retrospective study by López-Méndez et al 20 and the prospective study by McKay et al,8 considering that a patient was adherent if the percentage of days covered by the medication dispensed was ≥80% and using different calculation systems, obtained adherence rates of 83.6% and 77.9%, respectively, similar to our outcomes. There are other methods not considered in our study to measure adherence with lower feasibility, such as direct patient observation, questionnaires, electronic administration devices, remaining medication count or patient diaries. We obtained higher adherence rates with GA, which were not statistically different from IFNβ1a-im. 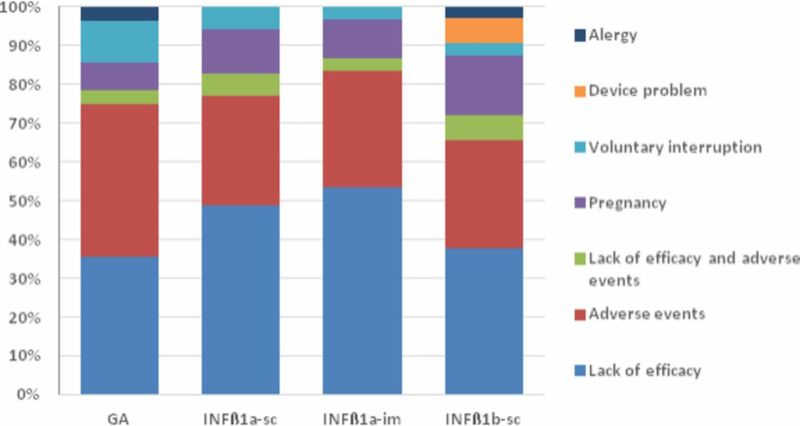 The risk of non-adherence with IFNβ1b-sc is 3.5 times higher than with GA, and the main cause for this could be the adverse effects associated with interferons (although, according to our data, their severity is not sufficient to become the main cause for treatment interruption). However, the objective of this study was not to analyse the causes for lack of treatment adherence. The frequency of administration did not appear to be a decisive factor for adherence to parenteral DMTs. When comparing our outcomes with the published literature we found contradictory information. There are studies demonstrating that IFNβ1a-im is the drug with the highest rate of adherence7 16 21 22 while, on the other hand, the prospective studies by Santolaya et al 17 and McKay et al 9 are in agreement with our results. We have not detected significant differences for adherence in terms of gender, age or EDSS; however, there is a certain trend for higher adherence among women and young patients. There is no indication in our outcomes of any relationship between adherence and persistence, while the study on interferons by Vicente Iturbe C et al 11 showed a higher discontinuation rate among non-adherent patients. The limitations identified for this study are its retrospective and single-centre design and the limited size of the series analysed. The results must therefore be interpreted according to these limitations. In addition, for the adherence calculation we have assumed that all doses dispensed have been administered, which could lead to an overestimation of our results. Questionnaries should be included in the daily routine as a complement to confirm that the drug has been administered. In summary, when comparing our results with other similar studies, we obtained lower persistence times, without identifying the causes, and similar discontinuation rates. EDSS was identified as an independent factor predicting treatment interruption. Regarding adherence, we have obtained results comparable to other studies, and it has been influenced by the drug used. However, we cannot claim that the differences found in adherence and persistence between the four treatment arms can be assigned only to those factors identified due to the limitations of our study and because there is a likely impact on adherence and persistence by other variables such as socioeconomic level, patient/healthcare staff relationship, disease denial, perception of lack of treatment benefit and adverse effects, motivation or family/social support. These variables showing the patient’s point of view have been collected by authors such as Fox et al 18 and Twork et al 23 and we have not included them in our study. Currently, oral drugs are being introduced into clinical practice, although parenteral DMTs continue to be prevalent. There is uncertain knowledge about the performance of these drugs beyond 2 years and there is a lack of comparative studies, which is why observational studies with prolonged follow-up times are relevant so that these drugs can be analysed comparatively. It is important to identify non-adherent patients, to analyse the reasons for this, and to develop individualised strategies in order to improve treatment adherence and efficacy; consequently, there will probably be an impact on persistence. Therefore, real-practice studies with adequate size and design are needed to collect clinical data on disease evolution and treatment efficacy, strict records that allow more accurate calculation of adherence rates and data from patients regarding health outcomes, which are particularly valuable in MS due to the characteristics of the treatments and disease. It is also necessary to reach consensus about calculation systems and definitions. Only then will we be able to identify and interpret accurately those factors that have an impact on persistence and adherence, which is information required in order to direct healthcare staff in their actions targeted to improving results in MS treatment. Multiple sclerosis is a chronic disease. This makes it relevant to study adherence and persistence due to the correlation between chronic conditions and the reduction in their rates. Patients with multiple sclerosis with higher adherence and persistence have a lower risk of relapses and a better quality of life, being associated with a lower use of healthcare resources. Multiple factors can have an influence on adherence and persistence, such as gender, age, EDSS, perceived loss of efficacy, adverse effects, problems with the injection device or dosing frequency. Additional data on persistence and adherence with DMTs. Although no significant differences in terms of persistence were found between drugs, patients on IFNβ1a-im had a higher persistence rate. GA had the highest adherence rate, without major differences from IFNβ1a-im. More evidence is provided about the factors that can influence both adherence and persistence, with EDSS being an independent predictor of treatment interruption according to the results. Elia Pérez Fernández (Research Unit at Hospital Universitario Fundación Alcorcón) for her assistance with statistical analysis. Ministerio de Sanidad, Servicios sociales e Igualdad. Estrategia en Enfermedades Neurodegenerativas del Sistema Nacional de Salud 2016 http://www.msps.es/organizacion/sns/planCalidadSNS/pdf/Est_Neurodegenerativas_APROBADA_C_INTERTERRITORIAL.pdf (accessed Oct 2016). Sociedad Española de Farmacia Hospitalaria. Modelo de selección y atención farmacéutica de pacientes crónicos 2013 https://www.sefh.es/bibliotecavirtual/Cronicos/AF_INFORME_PACIENTE_GESTION_SANITARIA.pdf (accessed Oct 2016). World Health Organization. Adherence to long-term therapies: evidence for action. 2003 http://www.who.int/chp/knowledge/publications/adherence_full_report.pdf?ua=1 (accessed Jan 2016).
. Recognizing nonadherence in patients with multiple sclerosis and maintaining treatment adherence in the long term. Medscape J Med 2008;10:225.
. Adherencia subóptima al tratamiento en la esclerosis multiple. Adherence to treatment in multiple sclerosis. Farm Hosp 2012;36:124–9.
. [Therapy adherence to immunomodulator treatment in patients with multiple sclerosis]. Rev Neurol 2013;56:8–12. EAHP Statement 4: Clinical Pharmacy Services.EAHP Statement 5: Patient Safety and Quality Assurance.